These are so-o-o delicious and so-o-o easy to make! They are also very sticky—so be sure to have plenty of moist finger towels on hand when you serve them. Instead of roasting these wings you could grill them over a medium-low to a medium fire, but I find they get crisper in the oven. Remember to allow at least twelve hours to marinate the wings. It may seem like there’s too much garlic and pepper in the recipe, but the brave—use it all. Combine the mushroom soy sauce, brown sugar, honey, garlic and black pepper in a bowl and mix the marinade well. To prepare the wings, trim off and discard the tips, and cut each wing at the joint so you end up with one tiny drumstick and one flat section per wing. Place the wings in sealable plastic bag or a large flat plastic container and pour the marinade over the wings, making sure that all surfaces are coated well. 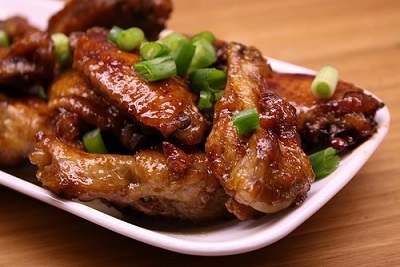 Close the bags tightly, and marinate in the refrigerator for 12 to 24 hours, shaking or turning the wings often. To cook the wings, preheat the oven to 450 degrees. Arrange the wings on a rack in a shallow roasting pan. Roast for 12 to 18 minutes, until the skin is dark brown and crispy and the meat has begun to shrink away from the ends of the bones. The juices should run clear when the wings are pierced with a knife point. Sprinkle with the garnishes and serve them up! Note: Jayna Marcelin lives and works in suburban Jacksonville. She is a nutritionist and a collaborator to CSMS Magazine.